Painting has been going pretty well so far, I have finished 3/4 of my Coldstreamers; hopefully will get the last six done tommorow! No clue yet about what I will do with the bases, I need to sort myself out some Plasticard, then I have no idea what I will put on top of it. 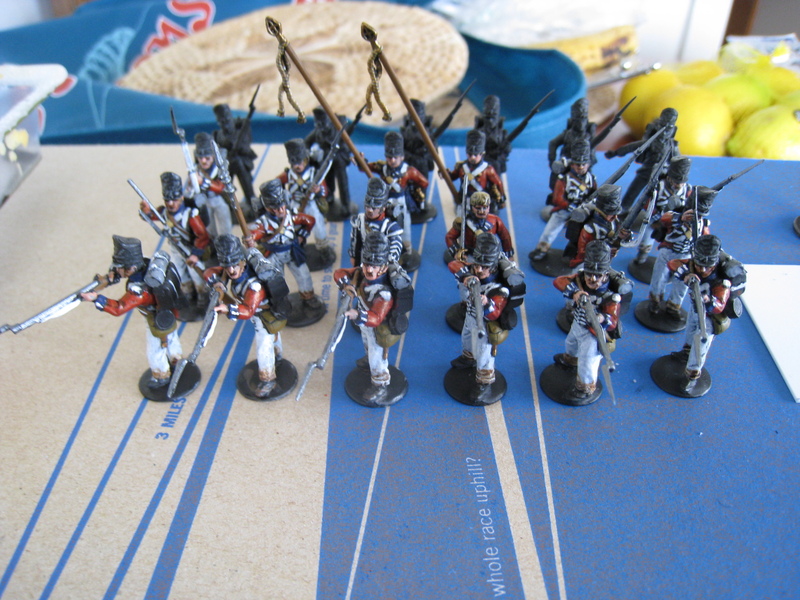 Ideally, I think I will try to base my guys for Waterloo (typical I know), so perhaps a muddy ground with a rough smattering of grass tufts? Not sure, we will see! I can't do anything with it until I get myself the bases themselves, which will be probably Monday of next week. Here is a zoomed out shot of the whole lot, the back rank are just black at the moment, freshly sprayed this morning! This is the unit's Sergant. 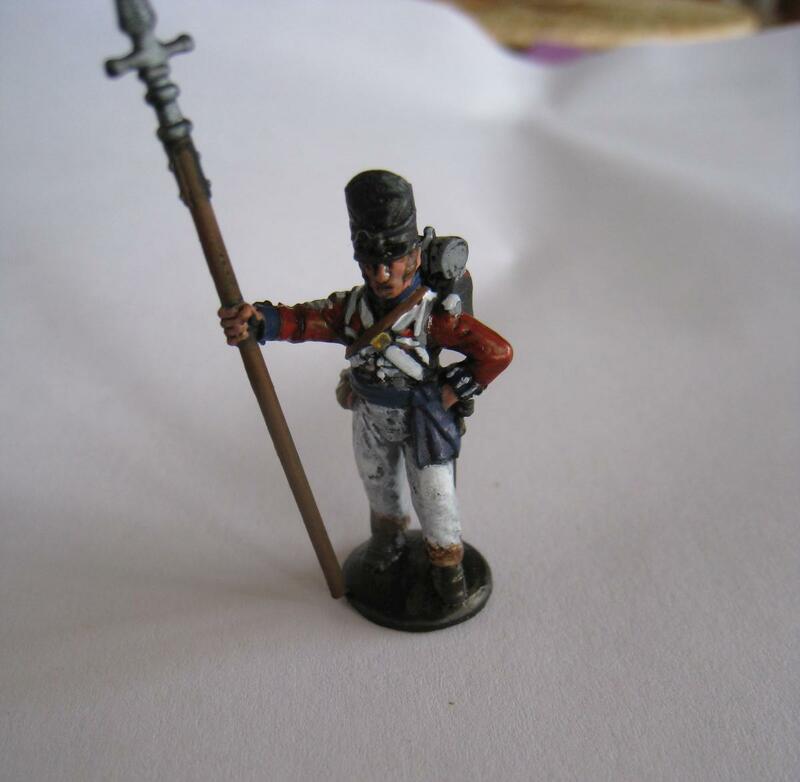 One thing that entertains me is that upon recieving the rank of Sergant, they have promptly lost their musket to be replaced with a pike- sure you might stab a cavalryman, but surely you would want to keep the gun? Although, the stories of musket fire are less than complimentary to it's effect or accuracy, so maybe the pike would be good! And finally the skirmish base for the unit. I will use them to represent the units with Skirmish value (plus they will look cool). As you can see he is already based on a coin (not stuck to the queen mind you) so it is likely he will be the first figure to be totally finished- likely as a test base! So what is next? 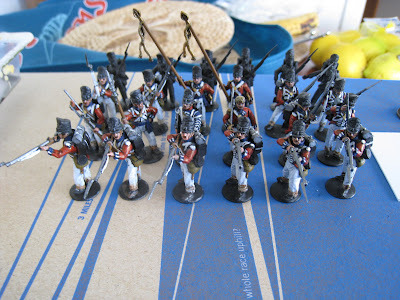 Finish those last six Coldstreamers, then I think I will make one of my small units of infantry. I will save my artillery and Highlanders until last (Artillery is a reward, and I am scared of the tartan! ).